by Shannon Clark in Family Budget | 8 comments | Contains affiliate links. Want to be at home with your kids instead of away at work? This post will show you how to be a stay at home mom – without constantly struggling with money. As I slumped into bed that night, lightly sleeping newborn at my side, my throat was tight and it felt like there was a block of ice where my stomach should be. I was devastated that my sweet husband had even uttered the word “daycare”. He supported me being a stay at home mom, of course, but only if we could afford it. Just weeks before I thought I might be bored staying home. Now, I dreaded even the thought of having to leave my little boy. I was desperate to figure out a way to stay at home, so I could spend time with my child. We were barely making it on one income while draining our savings, even more, every month. I tried to budget, but we never stuck to it. Our bad financial situation wasn’t helped by the tens of thousands in debt we owed. Maybe you’re like I was, feeling like a failure financially, but still determined to figure out how to make being a stay at home mom work one way or another. Well, here’s the good news. You can thrive financially as a stay at home mom – without constantly struggling with money. 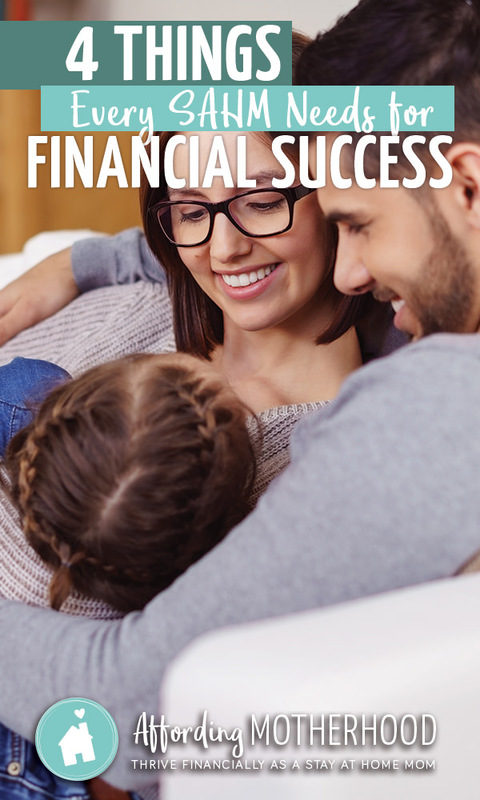 Thrive financially as a stay at home mom with these 4 steps. and instead, start feeling confident and successful with your finances. You already know you’ll need to master your budget to thrive financially as a stay at home mom, but it can be tough to stick to your budget consistently without overspending. I’ve been there. After that tense conversation with my husband, I tried to budget, but month after month we went over. There was seemingly always one more thing to pay for. I felt like a failure. Eventually, I learned the right way to budget so we could stick to it every month. As hard as I fought, it turns out, it’s the simple habit shifts in the way you budget that can add up to big changes for your finances. You don’t have to live feeling deprived. In fact, once you learn the right way to budget, you can make room in your budget for the things that are important to you, whether it be healthy food, activities for your kids, or homeschool curriculum. There’s one budget category that needs special attention, though, and that’s the grocery budget. Grocery budgeting is so important for stay at home moms because, once you’ve fine-tuned your family budget, groceries are often one of the only places left to find significant savings. According to the USDA grocery spending guideline, a moderate food cost for a couple with two young kids is $852 a month! Groceries likely make up a significant part of your family’s monthly spending, making this a great area for potential savings. Still, you still want to feed your kids healthy food even on a tight budget. You might even need to adhere to specific dietary criteria to help deal with health issues. This has been the case for our family. Our grocery budget used to be through the roof trying to eat healthily and accommodate special diets. As I started to make small, strategic changes, I was able to cut my grocery bill in half without compromising my family’s healthy diet. You can feed your growing little ones healthy food, even on a tight budget (without clipping coupons). The average American household owes tens of thousands in student loans, car payments, credit cards, and more. For a second, just imagine how much easier it’d be to afford to stay home without all those payments. I know, I know, even thought of trying to pay off debt can feel overwhelming or just plain impossible. It sure was for me. In fact, I used to assume I’d still be paying my student loans when my own kids were in college. Once we started chipping away at our debt, though, things really got rolling. We paid off $22,000 in less than 9 months, freeing up about $400 per month in our budget and making it much easier for me to stay at home. While becoming debt free may seem daunting at first, with the right plan you could pay off your debt and free up extra cash for more important things faster and easier than you might think. For most families, the 1950s cliche of an apron-wearing, cookie-baking stay at home mom doesn’t add up. Being a stay at home mom on one income isn’t the reality anymore. The average mom needs to supplement her family’s income with about $700 per month to make staying at home work financially. Thankfully, you can be a stay at home mom and still make money. There are lots of legit work at home opportunities available to 21st-century moms thanks to the internet. By the grace of God, opportunities came my way to earn an income from home, and I worked incredibly hard to make the most of them. After a couple years, I had grown two thriving home businesses that continue to allow me to stay at home with our kids. Working from home also gives your family added financial stability. In case of job loss or health issues, you won’t be 100 percent dependent on your husband’s income. Plus, you get the satisfaction of doing work you love while still caring for your family. A few weeks after the “daycare discussion”, I resigned from my corporate job that I love to stay at home full time with our newborn. Of course, I wish I had planned a little better to be a stay at home mom before I had kids. It’s been years now, and even though we had to make it work the hard way, I can now say with confidence that I’ll be able to be a stay at home with our kids for the long haul. What I really want you to take away from this post, though, is that it’s the small changes and simple systems, plus a little encouragement along the way that can add up to a huge difference for your finances – and your family. …and that’s exactly what I’ll show you how to do here at Affording Motherhood. Do you want to be a stay at home mom but can’t afford it? Are you making it work? Share your story in the comments! I have been a stay at home Mom for 12 years now! We have four kids. I have never had a side job, and I wouldn’t say that my hubby has a high paying job. I’ve done my best over the years though, using a lot of the same ideas you share here. Somehow we have made it work! I’m thankful. Stacey, I know this will be such a big encouragement to so many moms! :) Love hearing the different ways families make it work. I’m a SAHM to two kids. I do some side jobs (babysitting) but they mostly provide fun money to me and occasionally supplement the grocery budget. My husband works incredibly hard as an HVAC tech. God has also blessed him with being handy all around and he uses that gift to make extra money on the side while helping people out. Wal-Mart’s online ordering service is really helping me to stay on budget. It forces me to sit down and make a meal plan and I know exactly how much I’m spending. Because they deliver the groceries to my car I am not tempted to pick up extras in the store. I also try to do all my errands in one day to save on gas. We live in a rural area and leaving the house multiple days a week would wreak havoc with our budget. Oh you touched on something important here I think. It’s not just moms who can help boost the income by working from home but also hard working husbands doing side work too. I love that you’re making staying home work for you! Thank you for sharing your story Krysten! And great tip about Walmart online ordering. Our Walmart doesn’t seem to have a big selection for some reason, but we do have another store that has that option. I want to try it soon. Me and my husband have been living with family because he has had such a hard time finding a full time job that makes enough income for our family after graduating last year with his masters degree. He has a lot of student loan debt. I have stayed at home ever since I was pregnant with my first child 7 years ago. And only by the grace of God and help from family we have made it. But I feel like I have been stuck in survival mode ever since then. We don’t have any credit card debt, but we also don’t have enough to even afford our living expenses right now. Our dreams for our family seem so far away. Me and my husband are constantly stressed. I know I need to make an income from home to get out of this destructive lifestyle. Thank you for your advice on his blog. Good to share all the experiences in your life. I am one of the mothers that is facing financial difficulty. For the last one year or so, I am the only one working and I have my children attending International School and we have outstanding school fees. That is true, sometimes we need to really budget and live within our means. We also have debts to pay and only by the grace of God that we are still going and can face all the humiliations and uncertainties in life. Can I have some more good advices and guidelines on how to be really improve and being prudent in life?